FIGURE 5-7 (A) Schematic representation of the human glycoprotein hormone a-subunit gene. The bars indicate the four exons and the lines, which are not drawn to scale, represent intronic DNA. The solid areas represent the coding regions, and the open areas represent the untranslated regions. The intronic DNA is removed by splicing to form mature mRNA. The numbers indicate the size in nucleotides of each exon or intron. (B) Schematic representation of the human glycoprotein hormone a-subunit promoter. The transcriptional start site is indicated by the arrow and the TATA box is shown. The numbers above the line denote the position of the nucleotides relative to the transcriptional start site set at +1. The boxes under the line indicate the regions important for T3 binding (TR3), cAMP binding (CRE), and placental-specific activity (white box) and the putative locations of the gonadotrope-specific (dotted boxes) and thyrotrope-specific (black box) activities. The thyrotrope-specific region and the upstream gonadotrope-specific regions have been described in the mouse a-subunit gene. Reproduced with permission from Sarapura, V. D., Samuels, M. H., and Ridgway, C. E. (1995). Thyroid-stimulating hormone. In "The Pituitary" (S. Melmed, ed. ), pp. 187-229. Blackwell Science, Oxford. molecular weight and consists of 22 amino acid residues. a-MSH is represented in residues 1-13 of the ACTH molecule (Figure 5-10), and /3-MSH is derived from cleavage of /3-lipotropin (42-134 of translation product; Figure 5-10) to yield y-lipotropin (42-101) and further cleavage to yield /3-MSH (84101). The sequence of human /3-MSH is shown in Figure 5-12. 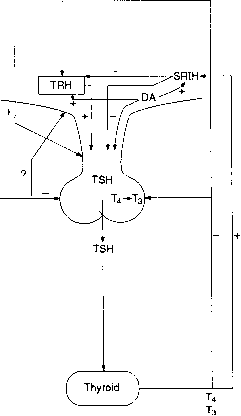 FIGURE 5-8 Neuroendocrine and peripheral control of thyroid-stimulating hormone (TSH) secretion. Abbreviations: T4, thyroxine; T3, triiodothyronine; TRH, thyrotropin-releasing hormone; SRIH, somatostatin; DA, dopamine. Reproduced with permission from Sara-pura, V. D., Samuels, M. H., and Ridgway, C. E. (1995). Thyroid-stimulating hormone. In "The Pituitary" (S. Melmed, ed. ), pp. 187229. Blackwell Science, Oxford.